No, it’s not my 45th post about great football books, but it is Super Bowl Sunday, America’s biggest secular holiday (that’s right – bigger than St. Valentine’s Day), so we’re numbering it this way. The blog may be for you, but it’s by me. This is a personal list – not a ranking – and is for suggested reading purposes only. Obviously, I have not restricted the list to books about professional football. Mark Bowden, best known for Black Hawk Down, not only tells the story of the game itself, which was the first of 2 consecutive NFL championships won by the John Unitas-led Baltimore Colts, but describes the state of the league and of television. 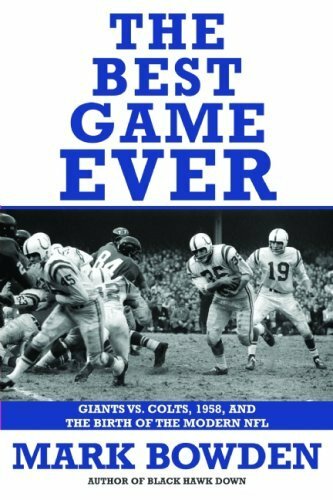 I thoroughly enjoyed the way he used the life arc of Colts end Raymond Berry to show the kind of hard work it took to become the best in the league. Josh Bliell, today the community spokesman for the Indianapolis Colts, tells his own story (with Mark Tabb) of the devastating day in October of 2006 when his Humvee was blown up by an improvised explosive device, resulting in the loss of both legs, the choice he made to describe that trauma as “one bad day,” and how that mindset provided him an entree to a career in the NFL. He’ll be in Harrison County next month telling his inspiring story, too. Carlton Stowers reports on how high school football in Penelope, Texas (Pop. 211) serves as a force to unite a community in myriad ways. Roger Director, a television producer, chronicles the 2006-2007 season of the New York Giants, surprise winners of the Super Bowl that year. Michael Lewis scored with this story of how football has changed, including Michael Oher’s progression from neglected child of a crack addict to coveted college football recruit. Oher is now a valued pro tackle with the Baltimore Ravens. You may recall the movie of the same name, which earned Sandra Bullock the Academy Award for Best Actress for her portrayal of Leigh Anne Tuohy, Oher’s adoptive mother. Ivan Maisel, college football columnist for ESPN.com, offers up hours of fodder for bar bets and debates with this fun list of which teams, coaches, and traditions are overrated and underrated. Herschel Walker, the greatest college running back this writer has ever seen, comes clean about the mental health problems that plagued his life, including multiple personality disorder. It’s packed with football stories, but illuminates a celebrity’s life with honesty and hope. This Easter Egg from NPR.org leads you on to a fun site, but read the coverage first.